See other delivery cart solution photos HERE. Topper Industrial refers to fork truck free cart delivery as the use of industrial carts to move material without the use of fork trucks (also, termed as fork lifts). Cart Delivery is the use of industrial carts to deliver material to a designated areas line side. Industrial carts can be pushed or pulled by a material handler and they can be tugged or pulled in a train of multiples. Material Handling Delivery Carts can be towed by tuggers and AGVs (Automated Guided Vehicles). Automated Guided Vehicles are designed to work with lean manufacturing ideals in mind. There are various types of AGVs on the market. 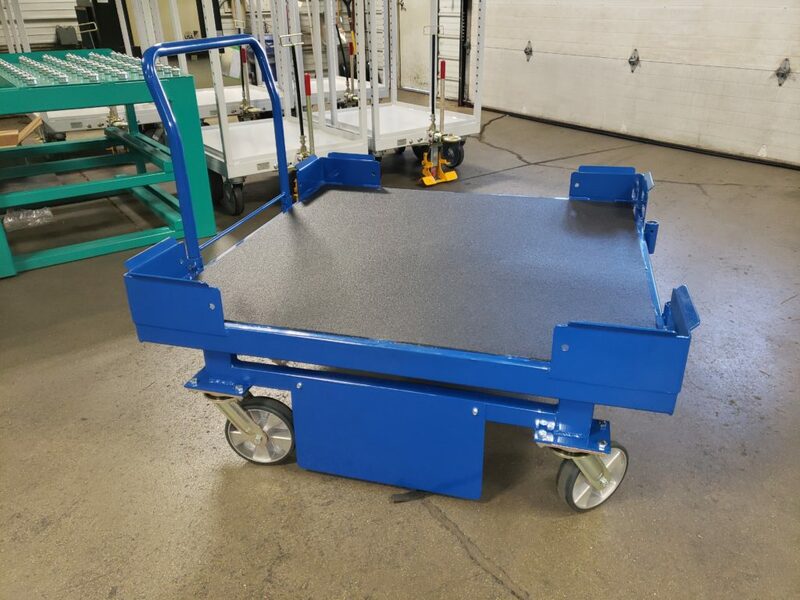 This cart was designed specifically to work with an AGV that utilize Tunnel Tow. The AGV/ Cart Delivery dynamic produces more flexibility, ease of use and increased production along a material handling assembly line. Additionally, the incorporation of AGV and delivery carts to one’s use of material handing processes proves essential in providing increase efficiency and reduce costs when related to the job of material movement from dock to and from warehouse to the assembly line. The 4 wheel static tunnel cart has a 50 x50 frame work and is designed for AGV tunnel tow. When using tunnel tow an AGV will position itself beneath a delivery cart that is designed and equipped to recognize the delivery cart once in specific position. Each AGV manufacturer with tunnel tow does this in different ways. The AGV follows lines on a floor that are mapped out to be followed automatically throughout a factory layout. The AGV automatically release full load delivery carts and will likewise hook empty carts for return to the warehouse. Topper Industrial refers to fork truck free cart delivery as the use of industrial carts to move material without the use of fork trucks (also, termed as fork lifts). Cart Delivery is the use of industrial carts to deliver material to a designated area. Industrial carts can be pushed or pulled by a material handler and they can be tugged or pulled in a train of multiples. Material Handling delivery Carts can be towed by tuggers and AGVs (Automated Guided Vehicles).